On Friday, November 13, Commander of U.S. Central Command Gen. Lloyd Austin, who is also a College of Education counseling graduate, was joined by U.S. Rep. Martha Roby of Montgomery for Auburn University’s second annual World Affairs Forum at the Auburn Hotel and Dixon Conference Center. The event was moderated by Gen. Ron Burgess, Auburn University’s Senior Counsel for National Security Programs, Cyber Programs, and Military Affairs. In spite of being one of the country’s top soldiers and statesmen, Gen. Austin began the event by showing his true colors – his orange and blue colors. He also gave a shout-out to the football team and encouraged Tiger fans to help beat Georgia the next day, where he would be in attendance. 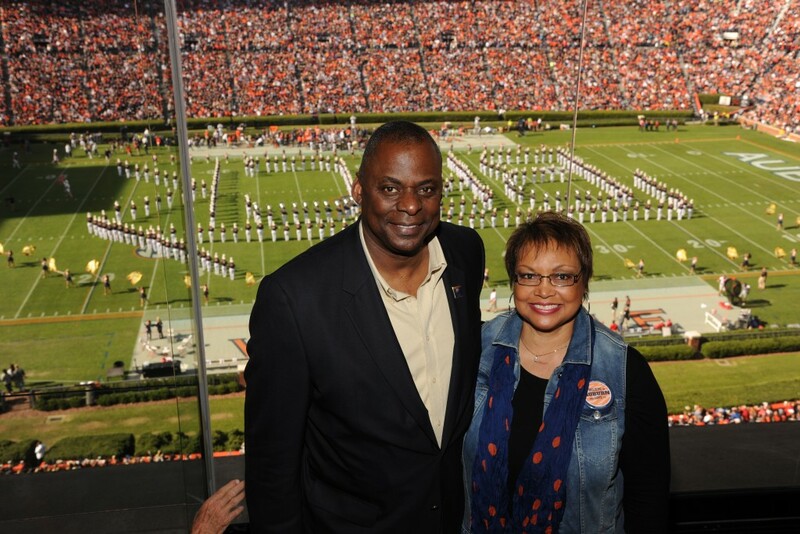 Gen. Austin was honored as the College of Education’s Keystone Leader-in-Residence in 2012. He received the Alumni Association’s Lifetime Achievement Award the same year. 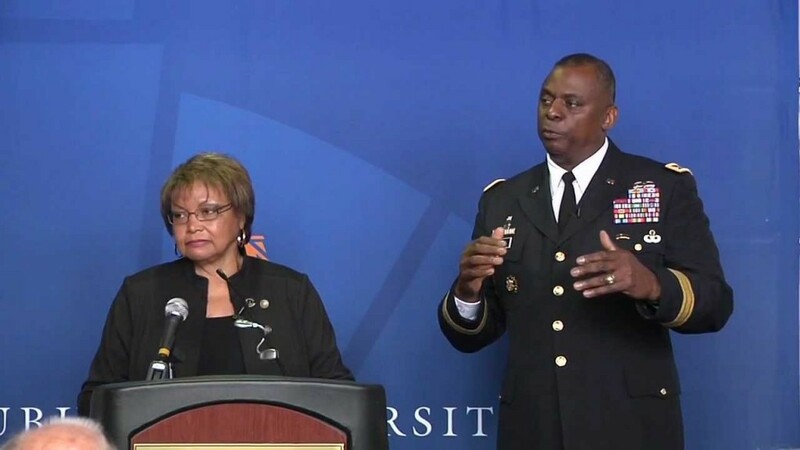 Gen. Lloyd and Charlene Austin led a presentation as Keystone Leaders in the College of Education in 2012. The forum had a question-and-answer type format. In general, Roby played more the role of a politician, speaking out on the threats posed by our rising national debt, and calling for a clearly-defined plan for combating extremists in the Middle East, where she has visited several times. Gen. Austin was more pragmatic, noting that the challenges posed by the so-called Islamic State, or ISIL, and the shifting alliances in the Middle East are complex almost beyond the imagination. Gen. Austin’s Central Command consists of 20 countries in the “central” area of the globe, including Afghanistan, Egypt, Iraq, Iran, Pakistan, Saudi Arabia, and Syria, among others. In response to a question on the Syrian refugee crisis, Gen. Austin noted again that this would ultimately require a political solution. He added that the Russian intervention in the Syrian civil war is really just an effort to prop up President Bashar al-Assad. “Russia’s extending this despot’s hold on power in Syria could make a dangerous situation even worse,” Austin warned. He noted that the Russian intervention made “a very complex situation even more complex,” and that even if Bashar were deposed, the power vacuum created would have unknown ramifications. Meanwhile, Russia’s military intervention there is strengthening the Iran-Hezbollah alliance, essentially in opposition of the entire Middle Eastern Sunni world, making it just another instance of shifting and dangerous uncertainties. “Again, this requires a political situation. These are alliances and conflicts that go back hundreds of years,” Gen. Austin said. The wide-ranging discussions covered questions about the security of Israel, the effect of lower oil prices on Middle Eastern economies, and the United Arab Emirates’ challenge of Iran’s sovereignty over two islands in the Persian Gulf. General Austin demonstrated encyclopedic knowledge of these and other regional and world complexities, answering each question with a balance of candor and diplomacy. The event was held on a day that will long live in history. Friday the 13th was the day that coordinated attacks in Paris, attributed to ISIL, left at least 129 people dead and hundreds injured. Sometimes even the leaders of the free world need a chance to enjoy some Auburn football. War Eagle!